There’s nothing better than helping a child learn. And that’s what science fair is all about! Some parents get very stressed out about science fair, but it’s not about winning or having the best looking board. It’s about helping your child use the scientific method to explore a topic that he or she is interested in. The biggest mistake that parents make is over-participation! Of course, your child will need some help finding a topic for and carrying out the project. But parents should be careful not to get too involved. At the end of the day, if your child can communicate knowledgeably about his or her discoveries, then you have completed a winning science fair project! This list will help with finding an idea for a project. Tweak the ideas as needed to suit your child’s age and interests. We all know that plants need water to thrive, but what kind of water is best? For this experiment, your child will need from 8 to 12 bedding plants. Choose plants of the same type, and select ones that are as close to the same size as possible. Help your child brainstorm the types of water that could be used to water plants, such as rain water, tap water, distilled water and spring water. Label the plant pots with the type of water that they will be given. You should have 2-3 plants for each type of water. Your child will need to water the plants each day with a designated amount of water. Be sure to keep the plants where they will get enough sunlight, but if you keep them out-of-doors, they will need to be under a cover to keep off rain water. Four weeks should be enough time to see results. Your child should record plant growth at the end of each week. This can be done by a combination of measuring, sketching and photographing. The easiest way is by taking photographs with a ruler so that the height of each plant is recorded. Which type of water caused the plants to grow taller? Are there other differences in the plants, such as color or sturdiness? Did any plants die? What could have caused them to die? What other conditions could have affected the outcome of the experiment? Learn more about water and plant growth. Your child could also test the effects of salt water and sugar water on plant growth. Another idea would be to purchase small cacti and experiment to see how often they should be watered for optimum growth. How can we keep ice cubes from melting? Children are familiar with the concept of ice chests. This experiment lets them build their own mini ice chests to see which types work best. Start with a number of plastic food containers. Remind your child that insulation works by trapping air around an object. Help your child brainstorm some types of material that might be good insulators. For example, you might test bubble wrap, foam peanuts, layers of paper towels, pom-pom balls, foam rubber, fiberfill, terrycloth, and wadded-up paper. Place ice cubes of equal size in the food containers and surround them with different types of materials. Put one ice cube in a container with no insulating material. This one will serve as the control. Work quickly so the ice cubes will start melting at the same time. Put the lids on the food containers and check after a certain period of time. Fifteen minutes is a good time span. You can use a kitchen timer or the timer on a smartphone. Although your child may have to move the insulating material a little bit to observe the ice cubes, remind him or her not to touch the ice cubes, as our fingers are quite warm! Let your child record how long it takes for each ice cube to melt completely. Which material insulated the ice cube best? Which material performed the worst? Was the non-insulated ice cube the first to melt? Were there other conditions that might have affected the outcome of the experiment? Your child can carry out a similar experiment using reflective material, black material and clear material to see which one protects ice from melting the longest when placed in sunlight, either direct or indirect. Your child probably knows that milk, butter and cream are all dairy products, but how are these products related? This experiment will explain a lot, and the two of you can enjoy some yummy spread at the end. You’ll need two one-cup containers of heavy cream or whipping cream. (You can also buy a pint and divide it into two.) Put one cup in the refrigerator. Let the other one come to room temperature. Put one cup of cream into a large clean glass jar with a lid. Start a timer. Help your child shake the jar vigorously until the liquid and fat start to separate. To keep the jar from breaking if dropped, you can shake it over a pillow or a layer of towels. You should see the cream first becoming fluffy like whipped cream and then starting to separate into a solid and a liquid. Shake until the separation is complete. Record the time elapsed. Repeat the process with the second pint of liquid. Be sure to time it, too. When you are finished, you can eat your experiment! Pour off the liquid. You can use it in cooking. Rinse the particles of butter and squeeze them into a lump, then refrigerate. Delicious! Why does shaking the cream cause it to separate? Which separated the fastest, the cream that was refrigerated or the cream at room temperature? What else might have affected the separation of the cream? This same principle is behind the color-changing milk experiment. Your child may know that people float more easily in salty water. This experiment demonstrates the greater buoyancy of salt water through floating an egg. You and your child will need to make a solution of one cup salt to five cups of water. You’ll need to add the salt a little bit at a time and do a lot of stirring. Next, arrange clear glasses in a row. Fill the first glass with plain tap water. Fill the second with one part of the salt solution to three parts of water. The third glass should be half and half plain water and salt solution. The fourth glass should be three parts salt solution to one part of plain water. The last glass should be all salt solution. Next, gently put an egg into each glass. Which solution contains enough salt to float an egg? In which glasses does the egg lift off the bottom of the glass? In the first glass that floats the egg, what is the water to salt solution ratio? Does the egg rise higher in the glass as the salt concentration gets higher? What else might have affected the outcome of this experiment? See some kid-friendly sink and float facts. You and your child can extend this experiment by using a hard-boiled egg and observing the results. You can also repeat the experiment using a sugar solution instead of a salt one. What kind of bread will mold the fastest? Help your child collect as many slices of bread as possible. (You can ask neighbors or relatives for pieces of their favorite breads so you don’t have to spend a fortune!) For each one collected, record the name of the bread and take a picture of the nutrition label. Then help your child put each slice of bread in a sandwich bag and label it with the name of the bread or with a number that has been keyed to the name and nutrition label. Your child should watch the bread and record on what day mold occurs for each slice. What type of wheat flour molds first – white, wheat, rye or other? Do breads with seeds mold faster or slower? Do the different types of bread grow different molds? What preservatives are contained in the different types of bread? How do they affect molding? After you and your child have gotten some preliminary results, you may want to take the experiment to a second phase with tighter controls of the variables. For example, you might compare several brands of preservative-free bread, or you might want to compare similar breads that use two different preservatives. Learn more about the preservatives in bread. Your child can also learn which environments grow mold the fastest by putting several slices of the same type of bread in different environments, such as the refrigerator and a warm area, or a well-lighted area and a dark area. We think of rust as being an annoyance, but it is also one of the most easily observed chemical reactions. Help your child explore the conditions that facilitate rust in this science project. Buy a dozen or so nails. Be sure that they are not aluminum or galvanized and that they have not been treated to be rust-resistant. Locate clear containers for the nails. Inexpensive test tubes are nice, but you can also use jars or tumblers. Help your child make one set of containers in which the nails are completely submerged in various liquids. Make a second set in which the nails are half-covered by the same liquids. Add one container in which the nail is completely submerged in water but the water is covered with a layer of vegetable oil. Be sure to use plain water for one of the liquids. Others to try include salt water, vinegar, carbonated drink and fruit juice. Your child will then observe the liquids to see which ones promote rust. Observations should be done daily. Which liquids caused the nails to rust the fastest? Which liquids resulted in the most rust? What qualities of the different liquids might have promoted rust? What is the role of air in creating rust? Did any other conditions affect the outcome of the experiment? Check out some oxidation facts for kids. If you have a sensitive scale, you can help your child weigh a nail before and after it rusts. What accounts for the change in the weight of the nail? Be sure that all the rust still adheres to the nail. Lots of gardeners are using bug hotels to attract beneficial insects to their gardens. What kinds of insects are most likely to move into a bug hotel in your area? This experiment may help you and your child uncover the answer. You’ll need several sections of PVC pipe. The pipe should be about three inches in diameter and should be cut into pieces about four inches long – about the length and diameter of a coffee cup. These can be cut with an inexpensive tool, or you may be able to get the pieces cut at the home improvement store where you bought the pipe. Help your child fill each section of pipe with a different type of natural material. Pack the material snugly so it won’t fall out easily. Some possibilities include sections of bamboo, sphagnum moss, lichens, twigs, pine cones, straw and hay. You can also fill one section of pipe with a round section of wood that you have drilled small holes into. You and your child have just made a bug resort with a variety of accommodations! Help your child place the bug houses on their sides in the garden. Put them on a board or stone so they won’t get too muddy if it rains. The next step is observation. Your child should watch closely to see what insects have taken up residence in the different pipes. He or she should keep an observation journal of the activity. At the end of 2-3 weeks, you can help your child carefully take the material out of each pipe and observe any insects living there. A special note: There is a possibility that a spider or stinging insect could have taken up residence. Your child should wear gloves and use tongs or other tools to remove the materials. There will still be some risk of a sting or bite, but it should be no more than is usually encountered in the garden. Did certain materials attract certain insects? Did some materials attract multiple types of insects? Did the insects build any observable nests or other structures? What material attracted the most insects? Were other creatures, such as frogs, toads or lizards, attracted to the bug hotels? What variables could have affected the outcome of the experiment? Learn more about bug hotels. Your little scientist can also experiment with discovering what bugs like to eat by putting various types of food in the garden and recording the insects that come to them. Children are usually fascinated by magnets and eager to experiment with them. Magnets can be very dangerous if swallowed, though, so exercise caution when buying magnets for your child. For this experiment you’ll need one large medium-strength magnet and a paper clip. Place the magnet on a smooth surface. Place the paper clip on the same surface and show your child how to play with it to see how close to the magnet you have to put it to demonstrate the magnet’s pull. Measure that distance. That becomes your control. Next help your child experiment with putting items between the magnet and the paper clip. Try paper, cardboard, aluminum foil, wood, and the blade of a kitchen knife. Do you have to place the clip closer before it will react to the magnet? How much closer? Show your child how to record the results. What materials seemed to block the magnetism best, and which affected it the least? How important was the thickness of the material? What else could have affected the outcome? Find information for kids about magnets. You can also help your child design an experiment to determine whether magnets work best when they are warm or when they are cold. For this experiment, you and your child will learn about the germiest surfaces in your house. The answers may not be what you expect! For greatest ease, buy petri dishes pre-filled with agar. Then all you have to do is show your child how to take samples from household surfaces with cotton swabs. Use sterile cotton swabs. Dampen one slightly and then slowly roll or twirl the swab across the surface of your selected item. Then use a similar motion to transfer what you have collected to the surface of the petri dish, after which the lid should be put on the dish. Help your child label the dish, then move on to testing another surface. Be sure your child uses a fresh swab each time. The cultures will grow most readily if placed in a warm, dark place. Try putting them in a box near an computer or other appliance that creates a low level of consistent warmth. Some advise turning the petri dishes upside down because otherwise moisture may collect on the top of the dish and drip down on the cultures. Your child should check for cultures every few days and photograph or draw them when they appear. Warn your child to never open up the dishes. As a parent, you need to be sure that the finished project is properly disposed of when the experiment is over. Put all the petri dishes into a zip lock bag with a small amount of a bleach solution. Although you’re unlikely to have grown anything dangerous, it’s wise to be cautious. If one petri dish shows more growth than the others, does that mean the surface tested was the germiest? What does it mean if one petri dish shows no growth? What variables could have affected the culture growth? Help your child learn more about bacteria. You can also use petri dishes to grow bacteria from your child’s mouth, before and after brushing. You can also compare that culture with one grown from your dog or cat’s mouth. The human body is amazing in its variations, but is it true that certain proportions are quite consistent? You and your child can explore this through using human volunteers. Be aware, however, that many official science fairs have strict rules for the use of human subjects. Your child may have to fill out extra paperwork, and participants may have to sign a consent form. Also, the project may require approval before it can be undertaken. When carrying out this experiment, your child should also avoid touching others as much as possible, even if volunteers are classmates. There are several easy ways to carry out this experiment with a minimum of touching. To measure hands and feet, for example, you can trace their outlines on paper. To measure height and other features of the body, you can use a string, which can be immediately labeled and then measured later. These methods make the measuring process fast and non-obtrusive. Which ratio was the most consistent across all the subjects? Which ratio was the least consistent? What variables could have affected the measuring process? Learn about human body ratios. If you have access to individuals of different ages, such as extended family members, you can help your child draw some conclusions about how body proportions change as individuals mature and grow older. The world is full of science fair ideas! 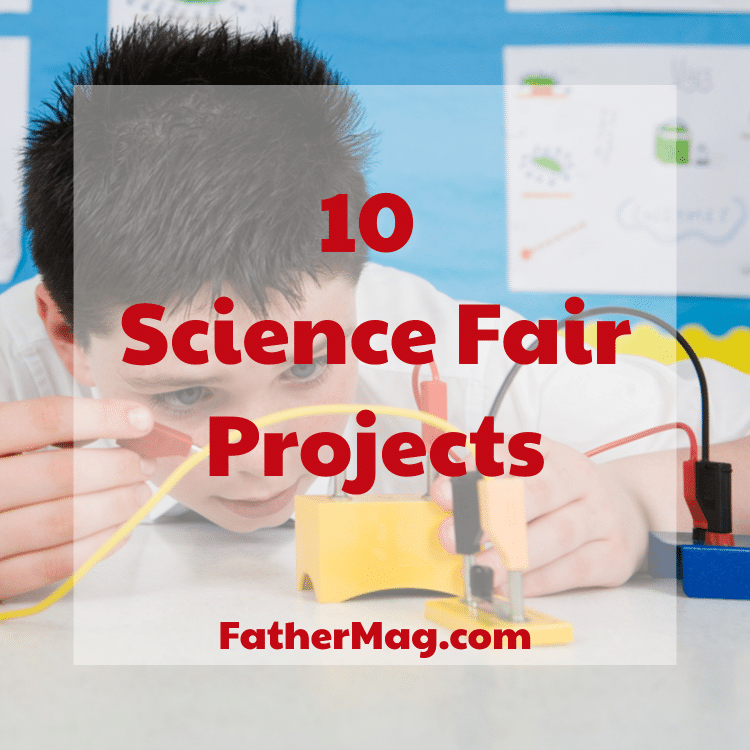 Here are ten more suggestions for cool science projects. Germinating Seeds. Do seeds sprout more quickly if they are scratched, soaked or briefly microwaved? Help your child treat seeds and then plant them to see which ones sprout fastest. Use beans or other large seeds such as nasturtium seeds. Birds and Oil Spills. How does oil affect the function of feathers? Help your child collect feathers from several different bird species. (You can often find feathers under a bird feeder or near water.) Help your child investigate how the feathers behave when put in water. Then put them into a pan of oil and water mixed and see what happens. How does the oil affect the insulating properties of feathers? Stalagmites and Stalactites. How are cave formations created? You and your child can use a solution of water and Epsom salts to simulate the way stalagmites and stalactites form. Take a piece of thick yarn, put a weight on each end and place each end in a jar of solution. Let the yarn droop in the middle, and delicate crystal growths should gradually form, both hanging from the yarn and growing from the surface below. Change a variable and run the experiment again. Fingerprint Investigation. Help your child discover whether fingerprints are clearer when left on a cold drinking glass or a warm one. Show your child how to use cocoa powder and a brush to reveal the prints and how to lift the prints with a wide strip of cellophane tape. Soap Bubble Strength. Help your child make a solution of one part of dishwashing detergent to five parts of water. One of you should blow bubbles with this solution, while the other times how long they last. After a set number of bubbles, write down the longest time that a bubble lasted. Add another substance to the solution and repeat the experiment. Additives to try include glycerin, corn syrup, sugar and gelatin. Which solution makes the longest-lasting bubbles? Passive Solar Power. Help your child measure the inside temperature of a parked car throughout the day on a sunny day. Compare with the inside temperature of a car on a cloudy or rainy day. You can also compare with a car that has been parked in a garage. Fiber Power. Obtain same-size samples of cotton, rayon, nylon, wool, linen and polyester. Help your child discover how much water each sample can soak up by saturating the piece of cloth and then squeezing it over a measuring cup. Have your child look at the fibers with a magnifying glass before and after wetting to see why some fabrics might hold more water than others. Center of Balance. Have your child walk on a narrow board that has been placed on the ground. Time your child walking with arms folded, with arms outstretched, and while holding a long pole like a tight rope walker. Discount any times in which your child stepped off the board. In which positions does your child have the best balance? Are the results the same if you try it? Probability. Using a deck of cards, show your child how to carry out several experiments in probability. For example, draw one card from a deck. How many times does your child have to draw again to get a card of the same denomination (although not the same suit)? Mathematically what is the probability of drawing a matching card? Repeat the exercise a set number of times and see how closely your child’s results approach the mathematical odds. Heat and Stretch-ability. Help your child compare how far a rubber band can stretch at room temperature, after being chilled and after being warmed. Be sure that your child wears goggles, gloves and long-sleeved shirt to avoid painful pops if the rubber band breaks. If your child is able to choose a topic for a science fair project, design and carry out a procedure using the scientific method and present the results of the project, then the project was a success. If you were able to give your child advice and support without taking over or losing patience, you were a success as a science fair parent. Both of you deserve a blue ribbon!